Aloha style music, music from Hawaii, Hawaiian Slack Key Guitar, regardless of what you call it, it is beautiful guitar music. After the Spaniards and Mexican vaqueros left the islands in the 19th century many of the guitars that they brought to the islands were given to the locals. The islanders kept the Spanish tuning that is known throughout the world (E-A-D-G-B-E) but others who didn't learn the fingerings for Spanish tuning detuned their guitars to an open major chord by slacking the strings, thus the name. The most popular tuning is an open G Major tuning known as "Taro Patch." Tunings that include a Major 7th note in the chord is known as "Wahine" tuning. There are literally hundreds of Slack Key tunings and many tunings are kept as family secrets and, like recipes, and are passed down from generation to generation. Slack Key Guitar pieces often are beautiful, laid back melodies which, for me anyway, remind me of laying of the beaches with the palm trees swaying, sun beaming down while the trade winds blow. Leward Kaapana, one of the masters of this style, picks up the tempo a bit on a song called Opihi Moemoe or Sleeping Shellfish. 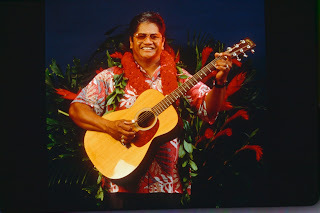 There are many great Slack Key players who have cd's out and a number of compilations that can be found for the uninitiated wanting to explore this beautiful and exciting form of guitar playing.